Italian for flavour. Made from fresh Italian chilli. 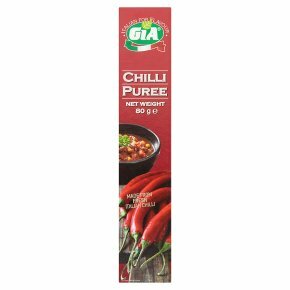 Recommended by the food masters.Gia Hot Chilli Puree is natural chilli which is selected and crushed ready for use. Careful handling will ensure that the product will retains the full fragrance and taste of chilli. Serving Suggestion: Use in a variety if spicy dishes, such as chilli-con-carne. Sauces and pizzas.